Sensibility, elegance, flawless style and noble sound of the ensemble – that is what make the quintet’s listeners gladly participate in their concerts. Those young musicians may play both classical pieces of baroque or renaissance music or original transcriptions of jazz and pop music standards with a lot of feeling. 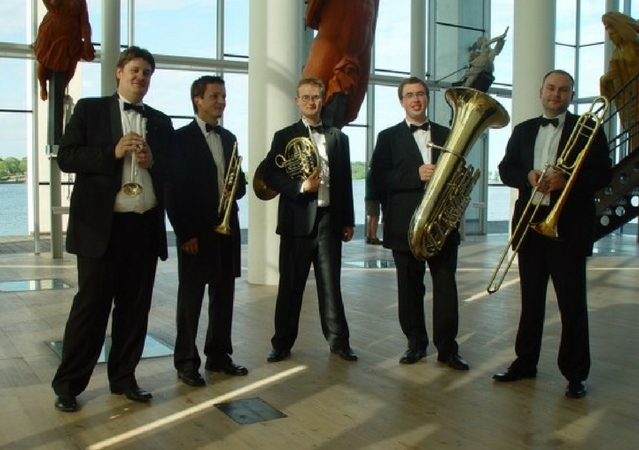 Although their careers started not long ago, the musicians of the Hevelius Brass have already taken part in many important projects in Poland and abroad. They have played for various audiences and their performances range from small concerts to great open-air events, including concerts at the Kalmar castle, during Days of the Gdańsk Pomerania in Bremen, at the “Music and Architecture” festival in Toruń, at the “Wigry Gardens of Arts” festival as well as at the “Kostrinella” International Music Festival in Kostrzyń. They have also appeared at the 1st International Congress of the Hansa Cities – Goleniów 2005 and at the award gala of the 30th Festival of Polish Feature Films in Gdynia transmitted by the TVP2 channel. They represented Poland during celebrations of the 50th anniversary of signing the Treaties of Rome in Berlin. They have been awarded in the 6th Polish Brass Ensemble Contest – co-organized by Prof. Roman Siwek and the Frédéric Chopin Academy of Music in Warsaw under the patronage of the Ministry of Culture. They have played concerts together with the Illinois Brass – the oldest and one of the most world-famous brass quintets, whose members include professors and lecturers of American colleges e.g. Ronald Rohm – a co-founder of the famous Canadian Brass. They have won the first place in the 2nd edition of the Forum of the Young and participated in mastery classes organized within the Blekinge International Brass Academy in Karlskrona in Sweden. The Hevelius Brass are in constant cooperation with Marek Czerniewicz, an outstanding composer from Gdańsk, who became known to the public after his artistic cooperation with Andre Hubner Ochodlo and the Agnieszka Osiecka Atelier Theatre in Sopot. The group also cooperates with Monika Kaźmierczak, a carillon-player from Gdańsk, and together they create a music project which is unique in the European scale. They have also played together at the Tour de Carillon 2007 Festival, the Kaunas Jazz Festival in Lithuania, and the World Carillion Congress Gdańsk 2006.